Why did this Russian spend 5 days in a bath? Weightlessness can be harmful for humans - this has been known since the first manned flights into space. To combat its effects scientists conduct experiments on Earth, simulating zero gravity. Sometimes a bathtub comes in handy. Aleksandr Khokhlov spent five days taking a bath, all for the sake of science. He wasn’t wallowing in your regular home bath, though. It’s called “dry immersion” and actually it feels quite similar to experiencing microgravity. For the experiment, Alexander’s body was engulfed in plastic sheeting. Only his arms and head were uncovered. His skin was protected by a bed sheet, which was changed every day. He only wore socks, pants, and a T-shirt. Despite all this, he looked relaxed and comfortable when we spoke. Alexander passed medical tests almost every hour and had electromyostimulation for three hours. The latter feels like a punctual rhythmic slapping/tingling on the thighs and shins. 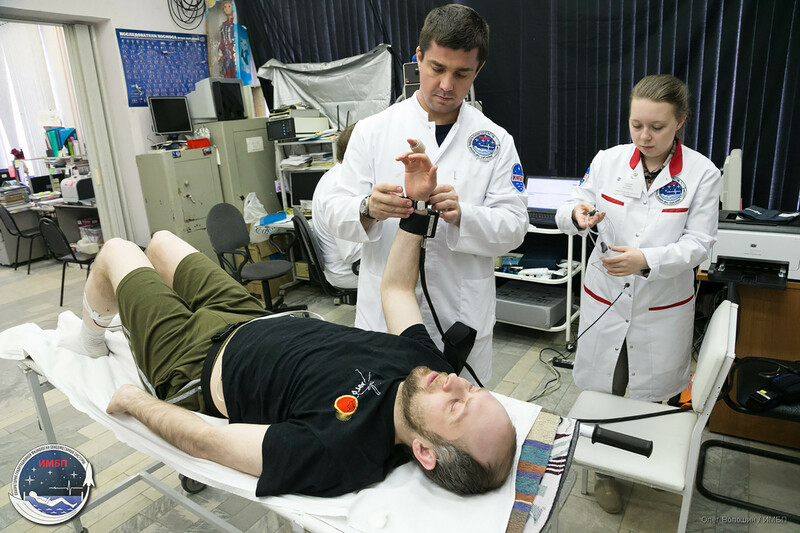 Low-frequency electromyostimulation is used for compensating the harmful effects of weightlessness on cosmonauts and is also useful for elderly and sick people with limited mobility. 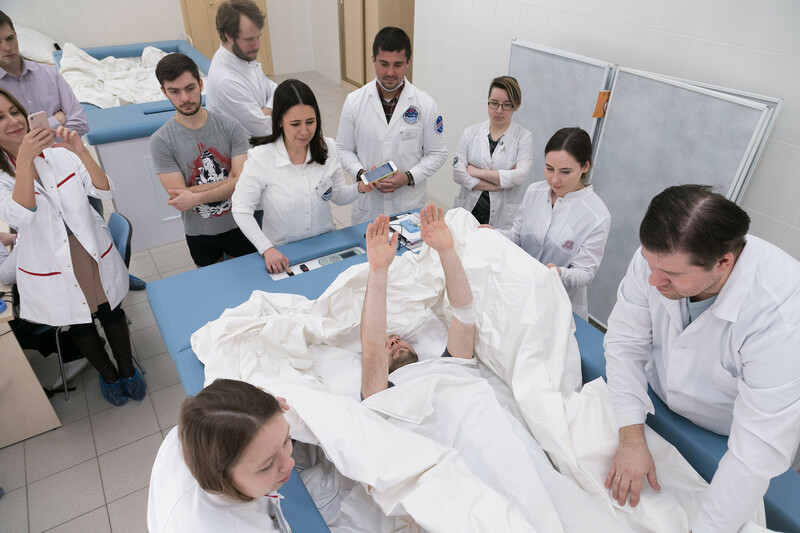 TheInstitute of Biomedical Problems (IBMP) where this experiment took place was founded in 1965 by the legendary Sergei Korolev and Mstislav Keldish for biomedical support of manned space flights. This is where professionals from physiology to psychology work together in a bid to make life safe, healthy, and comfortable on a space station. One of the main wonders of space is weightlessness. In 1970 two soviet cosmonauts (Vitaly Sevastyanov and Andrian Nikolaev) spent 17 days on a record breaking single flight (without docking with an orbital station) in a spacecraft. Although they worked a lot on the flight program, for the whole time they just hovered in weightlessness without physical activity. 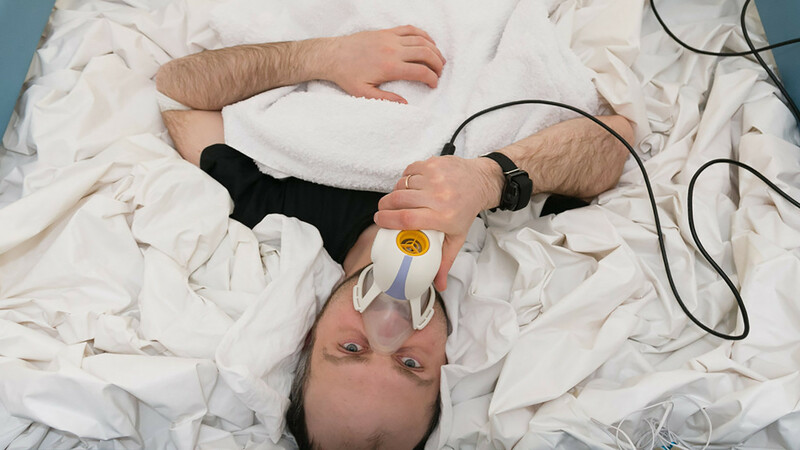 After this incident, space physicians and researchers from the IBMP were tasked with simulating weightlessness on Earth and developing the means to prevent its adverse effects. Microgravity is the major health worry for long manned space flights. There are three ways of simulating weightlessness on Earth. First - real weightlessness, when flying in an airplane along a parabolic trajectory, but it lasts only 20-22 seconds. Second - antiorthostatic hypokinesia: The subject lies upside down on a special bed with an angle of inclination from -6 ° to -30 °. 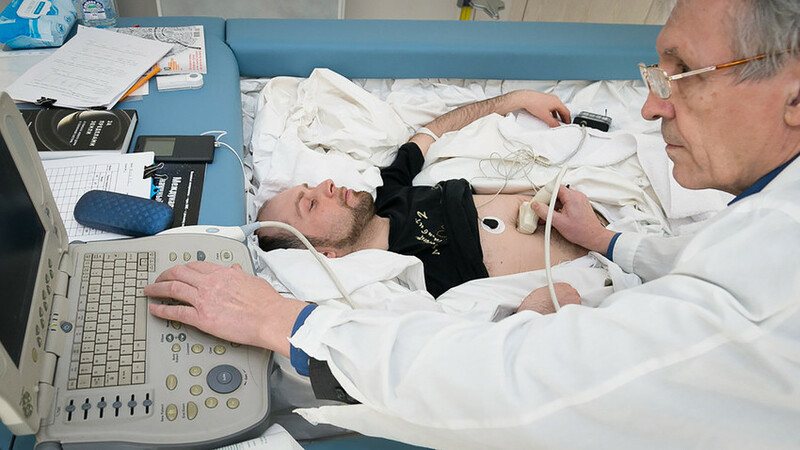 The method makes it possible to study the effect of simulated weightlessness primarily on the blood and lymphatic system. On the musculoskeletal system it works too, but slowly, it takes at least a few weeks, or better a few months. Third - dry immersion, when the subject is placed in a special bath, which is covered with plastic sheeting to prevent contact with water. In this case, the influence of "weightlessness" on the body appears much faster, on average in three to five days. This model provides the main factors affecting the state of cosmonauts in weightlessness. Model experiments with dry immersion pinpointed the reasons for the Nikolaev’s effect and methods of prevention. The solution: Exercise machines (treadmill, veloergometer, force loader or expanders), which help to prevent muscle atrophy in space. Cosmonauts train a few hours every day to be able to walk when they come back to Earth. The benefit of dry immersion studies are obvious not only for manned space flights but for helping people with special needs on Earth. Later this year the IBMP plans to place someone in dry immersion for three weeks. Aleksandr might be getting another call soon.